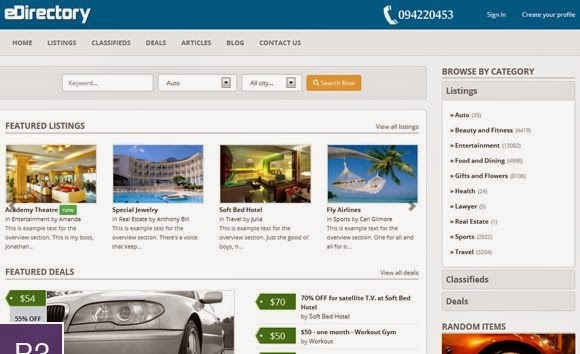 In this collection I have collected best Classifieds Website Themes. 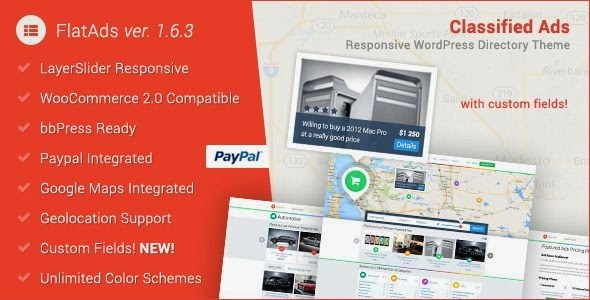 This classifieds templates are very modern looking theme that makes use of the latest design trends, to help you build a professional classifieds website. This themes are perfect for general classified website, job boards website, automotive websites and other functional directories website. 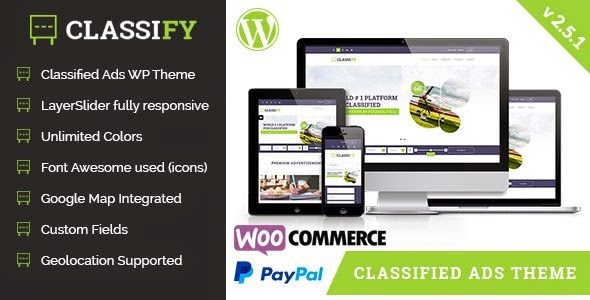 Classify is an amazing premium theme created for classified ads and directory listing websites. 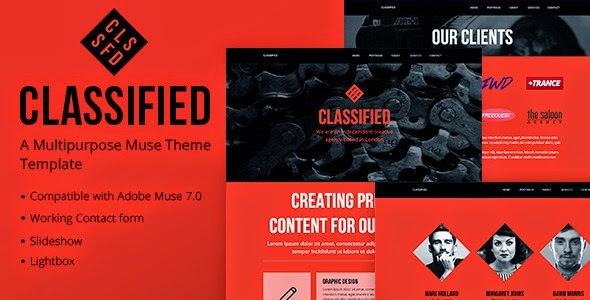 This theme is fully responsive and supports bbPress plugin. Its dynamic framework is built using bootstrap 2.3.2 and powered by redux framework. It is integrated with Google maps and geo location, working contact form, LayerSlider and translation support. This theme is Paypal gateway ready to expedite transactions. It is built with the newest HTML5 and CSS3 code to help your website keep up with the changing trends in web design. The FlatAds is a Premium Directory/Listing WordPress theme, super flexible and has a fully responsive design. Built with HTML5 and CSS3. 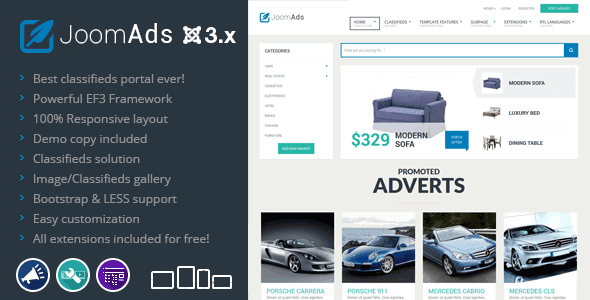 The FlatAds comes compatible with woocommerce 2.1, bbpress, MailChimp for WP plugin. One of its main features is its Google Maps integration, which enables you to show all your current listings on a large homepage Google Map and let users zoom in to explore the listings in your directory. It also makes use of map marker icons to help your visitors identify the type of listings they are looking at on the map straight away. It makes transactions fast and easy with its PayPal integration. 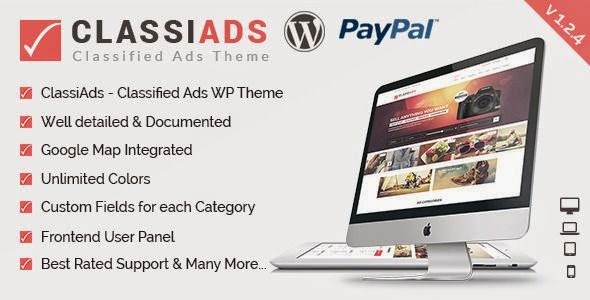 The ClassiAds is a Premium Classified WordPress theme, super flexible and has a fully responsive design. Built with HTML5 and CSS3. It has a lot of new and very useful features, like PayPal integration for secure transactions, Membership Plans, Front End Listing Submission, Facebook Login, Twitter login, Google Plus Login and Email Notifications. This theme has this unique design that you will either love it. 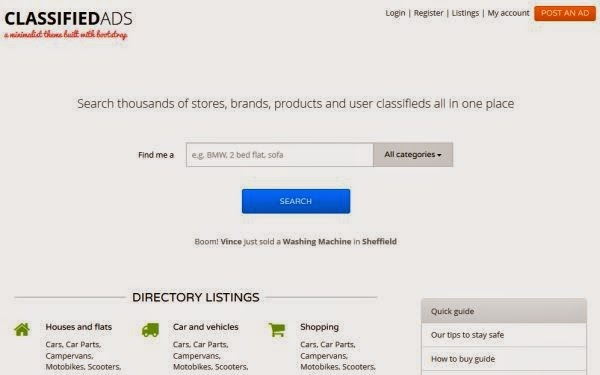 JoomClassifieds is an amazing premium Joomla theme created for classified ads and directory listing websites. Whether you need to create real estate, cars, hotel apartments or any other site with advertisements or you just want to include classifieds section on your site – this template will meet your requirements. With DJ-Classifieds extension you will be able to create custom fields suitable for each category, custom search options, custom locations, paid ads. And those are only few setting available in this great extension. 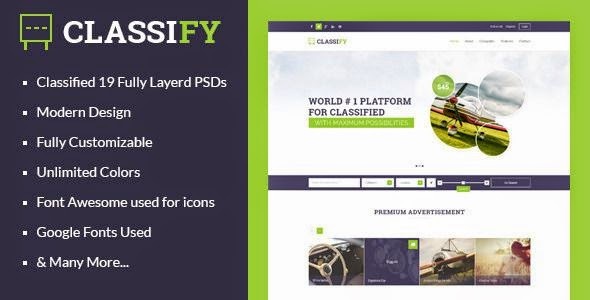 The Classify is a Premium Directory/Listing PSD Template, super flexible and has a fully responsive design. It has tons of unique layouts and 19 PSD pages. A lot of thought and care were put into Classify making it a pleasure to use. 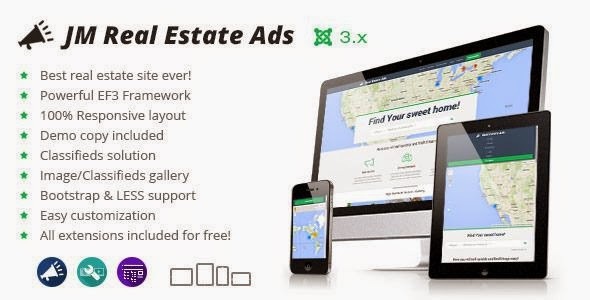 Real estate classifieds is an amazing premium Joomla theme created for real estate classified ads and directory listing websites. This theme is based on the useful and functional framework EF3 that provides many powerful settings to configure at the template manager. This is an simple and amazing Classified ads template created on Adobe muse. It has Parallax Scrolling background, Working contact form, Use over 100 fonts from Typekit and other great features. 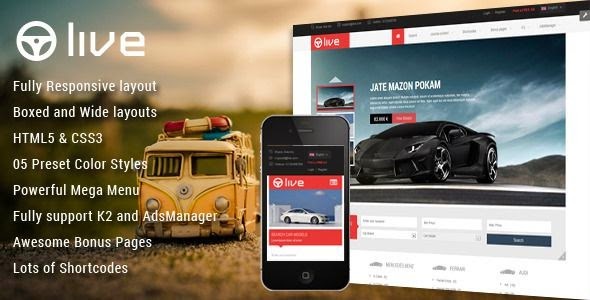 SJ Live is an amazing premium Joomla theme created for classified ads and directory listing websites. By using latest web development techniques: BOOTSTRAP, CSS3, HTML5 and LESS, the template is extremely flexible to customize. It is designed to adapt any screen resolutions with user friendly and best ever layouts. Moreover, with these advances, they allow you to optimize page loading speed effectively. By options, there are 2 types of layout that you can set for the Homepage: Boxed and Wide. It is integrated with AdsManager. JoomAds is an one the best Classifieds portal Joomla template. It is based on useful and functional Framework EF2 that provides many powerful settings to configure at the template manager. It is fully responsive and works in any device perfectly. BootListings is a Classifieds template designed entirely using Bootstrap 3. It uses a minimalist style, making your site look congested without sacrificing functionality. The layout makes it easy for users to quickly locate what their looking for without being overwhelmed by the different options. It also clearly highlights the "post and ad" button and has an easy to use interface to submit a listing. BootListings makes it easy and fun to develop your next classifieds website. eDirectory is an simple Classified template base on Bootstrap framework. Written in valid HTML5 that makes good use of proper semantics. 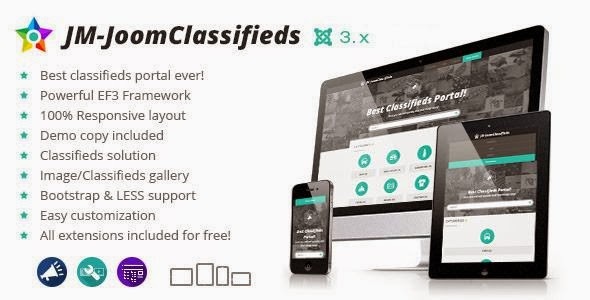 Item Reviewed: 12+ Deadly Best Classifieds Ads Website Themes 2015 9 out of 10 based on 10 ratings. 9 user reviews.